It’s Saturday! You wake up late but refreshed: it’s finally the weekend! You cheerfully call out to your suitemates to check on their plans. Suite museum outing? Group study session at a nice café? But as the hollow echoes of your voice trail away to nothingness down the empty suite hallway, so do these plans. You’re hit with an unpleasant but familiar realization: no one else is in. You trudge back, curl up in bed and decide to spend the day alone in your room. If the above scenario seems alien, this essay is for you: a Yale-NUS College student lucky to have a home just bus-stops away from school. It seems natural that many of us would leave school life behind over the weekend to stay at home. But what about those left behind? The scenario above was based on an actual experience shared during a conversation with Taylor (not their real name) from the Class of 2020. This was one amongst several excellent conversations I had last semester with many international students, who disproportionately volunteered their personal experiences and advice for incoming first-years as part of an initiative by Aloe—a new student group focused on mental health and wellness at Yale-NUS. Amid helpful suggestions for healthy eating to managing academic pressures, many of them talked about issues of loneliness and homesickness. What struck me most, however, was a common theme in these chats: the emptiness of their suites on the weekends. Singaporeans make up 60% of the school population, so perhaps it shouldn’t be such a surprise that the school looks deserted when we leave in large numbers. We leave behind a quiet and empty campus that contrasts sharply with the noise and lively bustle of the weekdays. What’s wrong with that? Singaporeans leave a half-empty campus behind, only to see it come alive again on Sunday night. To international students, the desire to go home is all too understandable. One feels uneasy blaming another for doing something, when one would do the same if one could. Like most I interviewed, James empathized with the desire to return home. “If my family were here, I’d go home for some home-cooked food or to spend time with my family too. I’d leave campus to attend my sibling’s dance concert or my aunt’s birthday party,” she said. Dave Chappell ’18 had similar thoughts. “I think it’s very fair for people to go back home on weekends. Although it’s a shame there aren’t more Singaporeans to hang out with, I also don’t blame them,” he said. But more often than not, empathy runs thin when when the closest most international students can get to their families is a Skype call, and the distance from home is measured in time zones and not MRT stops. The empty campus is a reflection and contributing cause of deeper problems and cleavages in the school community. As a small community of less than a thousand students, absences affect us disproportionately. For Singaporeans, the semester-long study abroad gives them a limited taste of what it’s like to be a foreigner-student. But as Chappell reminds me, international students at Yale-NUS are always on study abroad — a four-year long one. Bovankovich, my friend and former floormate, was a student in the class of 2018 when she decided to leave Yale-NUS (she is now a rising junior in the University of Delaware, her home state in the U.S.). She was the only international student in her suite. In sharing her reasons for transferring out, she stressed that she blamed no particular person at Yale-NUS. “I loved and still love my wonderful suitemates! I think it was particularly bad for me, coming from a family that’s really close-knit and big on community, so when I didn’t have that I didn’t know how to deal with it. Absences during Chinese New Year and some weekends were difficult. It was upsetting when people you expect to be there weren’t there,” she said. As is often the case, being ignorant of the problem is part of the problem itself. Singaporeans leave a half-empty campus behind, only to see it come alive again on Sunday night. Quite literally, Singaporean students do not see this disparity, with only the international students feeling the brunt of it. Thus in not seeing the problem, they perpetuate it. When we fail to talk about this weekly exodus, it has the potential to become problematic and even divide the student body. International students already start off on unequal footing relative to their local counterparts: less financial and social resources (family, friends, old schoolmates), less familiarity, along with the disadvantages of being a numerical minority. Other things like needing to pack their life into a suitcase or look for summer storage remind internationals of their foreign-ness. Some of these challenges are eased by a quick Google or school resources. But their combined effect is beyond the tangible; it is an alienating emotional and mental environment that stays throughout one’s school life away from home. In an Octant article last September, Quynh Nguyen ’20 relates a real-life example of falling violently ill and being unsure of how to obtain proper healthcare. “At that moment, I missed my mother and father so much to the point where I had to call them immediately even though it was midnight here,” she said. 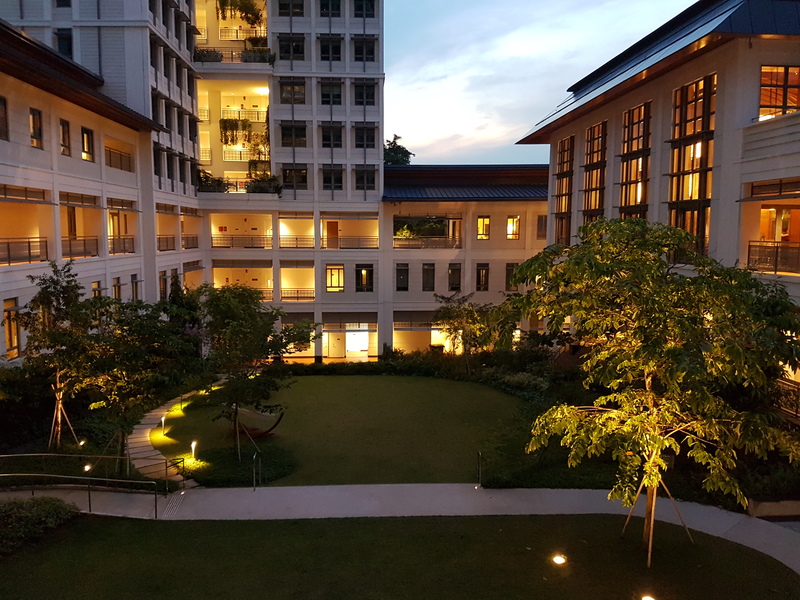 Professor Catherine Sanger, former Vice-Rector of Cendana College, stated that it is important to respect the fact that many Singaporeans choose Yale-NUS in part to remain near family during their college years. But on the other hand, all students miss out on key elements of the college experience if half of the population disappears between Friday night and Monday morning. “International students miss out on the opportunity to befriend and form deeper attachments with Singaporean students. Meanwhile, our Singaporean students miss out on social and extracurricular learning that happens over a lazy brunch or late night on weekends,” she added. Many international students interviewed reflected that observation, indicating that they would group with other international students on the weekends to explore Singapore or study together. But this literal manifestation of the international-local divide may become more and more permanent. Professor Sanger notes that international students may then prefer to live with other internationals so they don’t feel alone on the weekends, which in turn “undermines everyone’s ability to have a truly diverse social experience”. When contacted, the Dean of Students Office indicated it does not actively collect data on the nationalities or ethnic mix of suite arrangements, and could not make detailed information on floorplans public. However, some internationals I interviewed have confirmed Professor Sanger’s observation (all chose to remain anonymous to avoid offending their former suitemates). Taylor, for example, will be moving to a suite with only international students next semester to have a more involved residential experience. A student from Elm College in the Class of 2019 also indicated making plans to have more internationals in her suite this semester, while another student from Cendana College in the Class of 2018 switched suites in the first semester of his sophomore year for related reasons. Gazit, who is a peer counselor with P.S. We Care, notes that the “empty suite” problem has come up in a few counseling sessions. “But often it’s in relation to or expressed as a factor that exacerbates other issues they’re dealing with, like stress, homesickness, or feeling lonely or depressed,” he added. Issues surrounding wellness and mental health are not unique or new to this school. An Octant article last October documented the insufficient provision of mental health resources, lack of feedback channels, and disruptive changes in personnel in an already stressful academic environment. But as Tiffany Sin ’17 said in the article, wellness is beyond just a cosy room on campus. Suitemates are a family away from family, a vital component of an international student’s support network. An extensive nationwide survey in the U.S. found that students who have no roommates are 1.6 times more likely to report high levels of distress over homesickness than those with at least one roommate. Not only internationals are affected, however, when Singaporeans go home on weekends. Professor Sanger notes that it puts pressure on the entire community to cram all academic, extracurricular, and social programming into the 5-day school week, as opposed to spreading it more evenly across all seven days. “This contributes to all students getting far too little sleep during weekdays, and sacrificing their quality of experience as they run from club commitments to course deadlines to each other’s concerts and plays,” she added. Chappell, who was formerly Editor-in-Chief of The Octant, similarly notes that while he thinks it’s important to relax and socialise in the weekday evenings, it is already hard to fit in anything more. An empty college is not just a problem for the internationals to ponder over, but one that affects the entire community as well. The empty suite is a tricky problem, but also a symptom of other, bigger, problems. Hard to notice or discuss in the first place, it both reflects and deepens inherent inequalities, is inextricably linked to issues of homesickness and wellness, and if left untackled, creates an environment hostile to mental health. But the empty suite is also a choice. A semester of Comparative Social Inquiry (CSI) teaches us (and for incoming first years—welcome, by the way!—will teach you) that the little choices of individuals, morally simple and personal at first glance, often have unintended and complex ethical consequences for the collective. In the next part, I discuss why and how we should wield this particular choice to create a Yale-NUS that everyone can call a home. This is the first part in a two-part series, where the second part will appear in issue one, volume seven of the Octant. In it, Tee will discuss the reasons why we should care about the problem of an empty campus, and what we can do about it. Tee Zhuo ’18 is a member of Aloe, a student group focusing on mental health and wellness policies at Yale-NUS (to learn more about Aloe, contact the author or Alex Meyer ’18). He is a Singaporean and his family stays near the weird and deeply traumatizing Chinese-hell-themed park, Haw Par Villa.